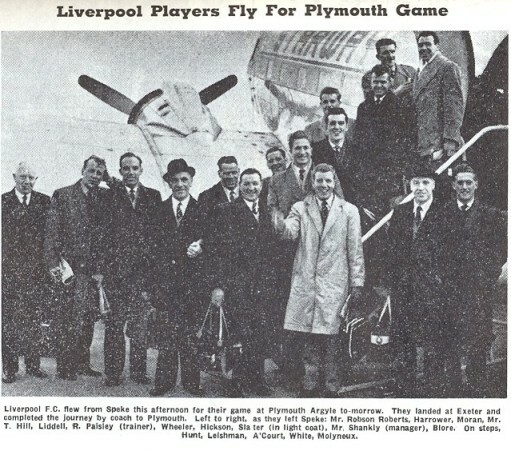 The magnificent 1961/62 promotion season - LFChistory - Stats galore for Liverpool FC! 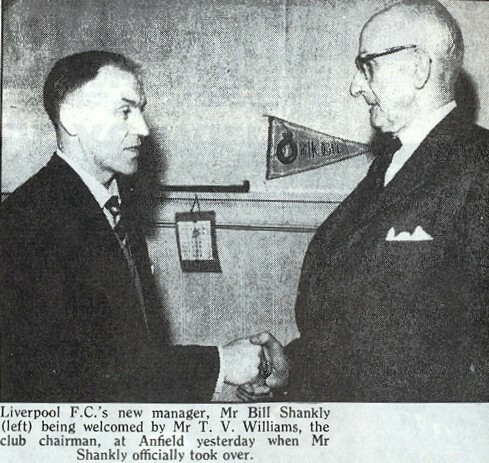 When Bill Shankly arrived at Anfield in December 1959 nobody had the faintest inkling that he might do more than possibly get us back into the First Division, from which we had dropped five years earlier. Our sojourn in Division Two had gone on longer than most had predicted and we were, frankly, dangerously close to becoming accepted as a second division side. Phil Taylor had done his best to improve the side that he had inherited from Don Welsh but somehow the club was unable to take that necessary step that would have got them back in the top division. The chairman during those frustrating years in the fifties was Tom Williams, who seemed to us to be just another faceless football club director who revelled in the glory of local fame. Thomas Valentine Williams was more than that. He realised that the club was in danger of becoming the footballing equivalent of a second class citizen and he decided to do something about it. Shankly's ability to to run a small club had been well documented and it was rumoured that a few of the country's bigger clubs (Liverpool included) were interested in appointing him as their boss. In the event it was Huddersfield who took the plunge and they took him on initially as a deputy to their manager, Andy Beattie, with whom he had played at Preston North End. At the time Huddersfield were in severe trouble at the bottom of the old Division One and they were duly relegated at the end of Shankly's first season at the club. In a situation that had uncanny similarities to the one that developed at Anfield over 40 years later the newcomer took over from the incumbent within a year of joining the club. Within a year or so of taking the reins rumours circulated that Shankly was unhappy at Leeds Road because of the parsimony of the board. Top players were sold, two of whom, Ray Wilson and Denis Law, would go on to international glory with England and Scotland respectively. Liverpool were understood to have approached him during this period with a view to him succeeding Don Welsh who had just been dismissed but the thorny problem of team selection proved to be the stumbling block. Like most other clubs Liverpool were still locked into the ancient system whereby the board of directors picked the team and the manager was judged on how that team performed. Shankly was having none of that and there the matter rested. However by 1959 Tom Williams realised that something needed to be done if Liverpool were not to become mired in the lower divisions for the foreseeable future. He convinced his co-directors that, in order to attract a top manager, full control of all team matters would need to be vested in him and, having got their approval, he made another approach to Huddersfield and the deal that was to have such huge ramifications for Liverpool FC was done. Shankly had left one struggling Second Division team to join another one but he could see the possibilities that existed at Anfield and, once he had been given the assurances about control of all footballing matters he took little persuading to cross the Pennines. Strangely enough, given the enthusiasm and energy that he was to inject into the club over the coming seasons, his arrival was very low-key. I don't recall any press conference taking place to introduce him to the local media and there were, of course, no television cameras in evidence. Little changed on the pitch, either. His first two games in charge were both defeats although there was a recovery of sorts in the New Year of 1960 but the only signing was that of Sammy Reid on a free transfer from Motherwell, a player who never actually had a game in the first team. The season ended with Liverpool where they had been ever since they had been demoted - just outside the promotion places. Surely the new manager would go on a spending spree during his first summer. But no, he made only three low-key signings. Kevin Lewis arrived from Sheffield United, Gordon Milne from Preston and local boy Alf Arrowsmith from Ashton (all three were to play significant parts in the immediate future). We wanted stars but that was not Shankly's way. In effect he spent what was left in his first season at Anfield and the whole of his first full season taking stock of the players he had inherited. Roger Hunt had established himself in the side by the time that Shankly arrived but Gerry Byrne, later to be in England's World Cup squad in 1966, and Tommy Lawrence had hardly had a game. Both were to become cornerstones in the drive for promotion. The 1960/61 season was no more successful than before. Third place was the best we could manage. Had we got the right man? The question was to be answered most emphatically the following season. Two signings made all the difference. Ian St John, a Scottish international, was bought from Motherwell for £37,500 just before the end of the 1960/61 season (and promptly became a hero by scoring a hat-trick against Everton at Goodison Park in the Liverpool Senior Cup Final) and Ron Yeats arrived from Dundee United for £22,000 during the summer.